Then there are stir fried veggies. Dunk any vegetable in a mixture of soy sauce, tomato sauce, some chilli, corn flour and you are there. I've never been able to replicate this dhaba chinese flavor at home, but decided to give it one last try for this month's AWED. Before we get to our recipe for Beans and Tofu Stir Fry, some good news. 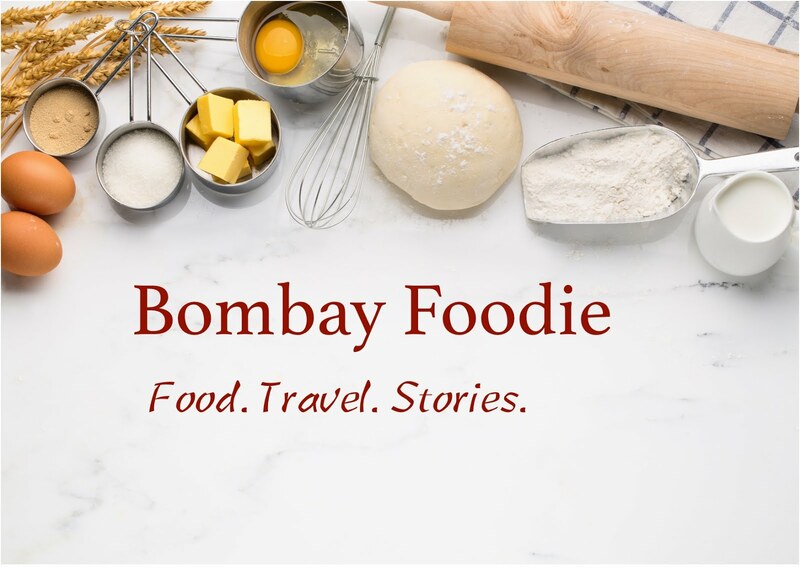 Swati from Chatkhor has passed on Bombay Foodie's first ever award. Thanks a ton, Swati - you truly made my day. And now back to the dish for AWED. This isn't true Indo-Chinese (if there is such a thing). My biggest problem with cooking Chinese at home is the over-salty overbearing flavor of soy sauce. The recipe I learnt many years back called for vinegar to balance that and some sugar, but I replaced the two with naturally sweet balsamic vinegar. 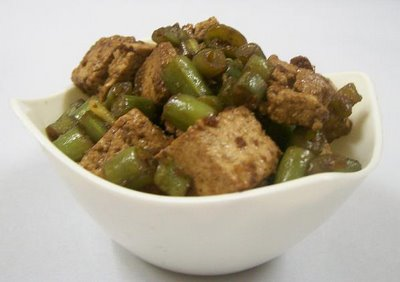 To make beans and tofu stir fry, cut 100 gms tofu into squares. Cut 100 gms beans into small pieces and parboil until half cooked. Peel and finely chop 2 garlic cloves. Heat 1 tbsp vegetable oil in a non-stick pan. Add beans and stir for a minute. Then add tofu and stir fry for 2-3 minutes on high heat. Mix 1/2 tbsp each of dark soy sauce and balsamic vinegar. Add to the pan and reduce heat to a simmer. In a bowl, mix 1/2 tsp cornflour and 2 tbsp water. After a couple of minutes, add cornflour to the pan and cook on high for 1-2 minutes. I didn't add any salt, but do add some now if you like. Done! Beans and Tofu Stir Fry goes to DK for this month's AWED. Congrats for your award, and I really appreciate you passing it to me. Indo-chinese is my fave too..stir fried veggies and manchurians with yummy spicy fried rice is an ultimate combo..!! !your entry looks yummy! !and congrats for your award!!! thats one lovely dish simran..I am still thinking what to make! Oh..I love dhaba chinese. My chacha used to take my bro n me on his "luna" to the linking road stalls to eat yummy fried rice. I have never tasted fried rice that tasted so good again. Your entry looks fab. never thought of using balsamic vinegar for chinese. Congrats on your award!! Looks good. Did it make the dhaba Chinese grade? Liked that term by the way. I believe the guy who invented Manchurian is called Nelson. Saw him talk about it on TV sometime back. I didn't know I was the first commentor on your blog. yeah..I actually got paired up with engineerbaker. It just so happened that those cookies were what caught my eye and then jugalbandi did the post on them a few days later. Their pics are soo good! My little guy's name is Sidhant and he is 3.
first time to your blog. Your blog looks great. Hey, this look like a nice Chinese dish. I wanted to share a great site with you about Chinese cooking. They have great how to video, tutorials, and instructions on how to prepare great tasting Chinese food. You can get some free recipes to try out. If you have problems making your food turn out right, they have easy to understand videos that will take you by the hand to make your food taste great. You really need to take a look at this, take a look at http://www.youtube.com/wokfusion, or go to them directly at http://www.wokfusion.com.